According to U. S. law, a microbrewery is defined as any commercial brewery that produces less than 15,000 barrels of beer each year. On our new system, we can brew 7 barrels per batch, or between 1,000 and 1,500 barrels per year. 1005 W. Laraway Road, Unit 260, New Lenox, IL, in the Country Creek Commons shopping center on the northwest corner of Laraway and Nelson roads. Do you use locally grown ingredients in your beers? According to the 2008 U. S. Farm Bill, locally or regionally grown agricultural food products are defined as any products that are transported less than 400 miles from their origin, or the State in which they are produced. Hickory Creek Brewing tries to use ingredients that meet this definition whenever possible. We grow some of our own hops on our private property, a former farmstead on the west bank of Hickory Creek in New Lenox Township. We also have black walnut, wild pear, crab apple, and mulberry trees on our property. We use these fruits and nuts in certain beer recipes to add interesting flavors. We want to focus on one thing -- great beer. So we do not prepare food on the premises. However, you're entirely welcome to bring food in with you or have it delivered while you're here. We provide menus from near-by restaurants that deliver. There are also several phone apps you can use to find and have food delivered. We also have free bar snacks and host food trucks, usually on weekends. Hickory Creek Brewing is family- and dog-friendly. Kids cannot sit at the bar and dogs must be on a leash, but feel free to bring them! We have board games to help keep the kids occupied, as well as water, soda, and kiddie cocktails for them to drink. We can also provide water and biscuits for your dog. How do you come up with the names of your beers? Yes! Bring your own clean growler or buy one of ours. 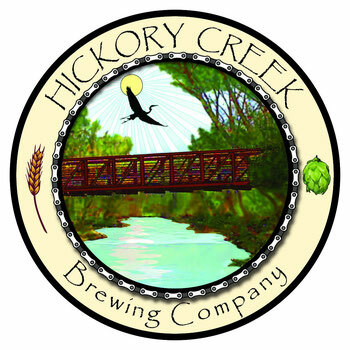 You can purchase Hickory Creek Brewing Co. growlers at our location for a price of $5 for a 32-oz. growler or $8 for a 64-oz. We can fill your growlers for a separate price of $12 for 32 ounces or $24 for 64 ounces. If you want to bring your own growlers, we can sanitize them but will not be set up to clean them. So please bring clean growlers only.